Inspired by this post by need-tea with all its pretty pictures of books, I thought I’d show you pictures of books I have bought in the past month.. Some of these I have posted on twitter, but not here. 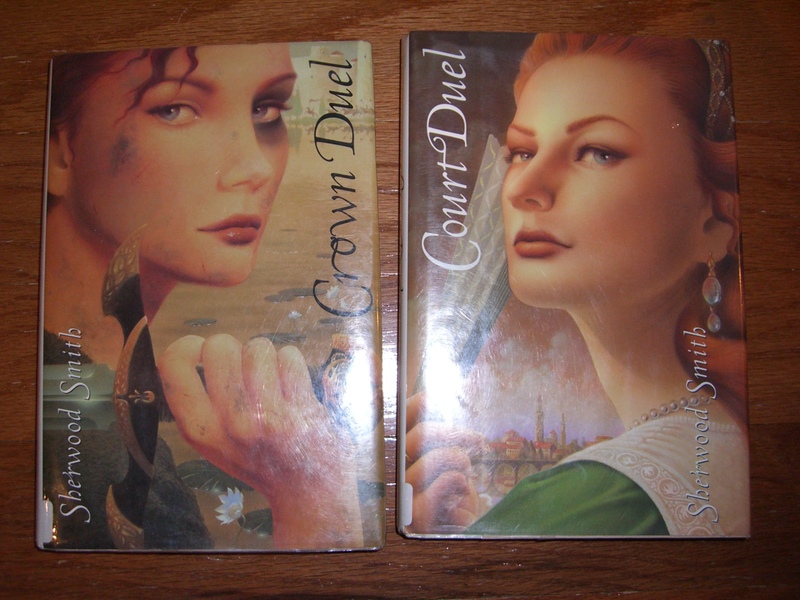 Crown Duel and Court Duel by Sherwood Smith: I have read (and own) this duology (I also have the eBook! ), but I don’t ever see the hard cover versions of the books where they are actually separate. Plus they were $1 each at a library sale in Kennebunkport, ME. Soo… I have rescued them. Consider this post as evidence of my book addiction! Speaking of library sales and books I’ve already read.. there was a 5 paperbacks for a dollar sale at my local library, and I couldn’t resist getting copies of old-school versions of books I already own: Beauty by Robin McKinley (with $1 B&N sticker still on it! 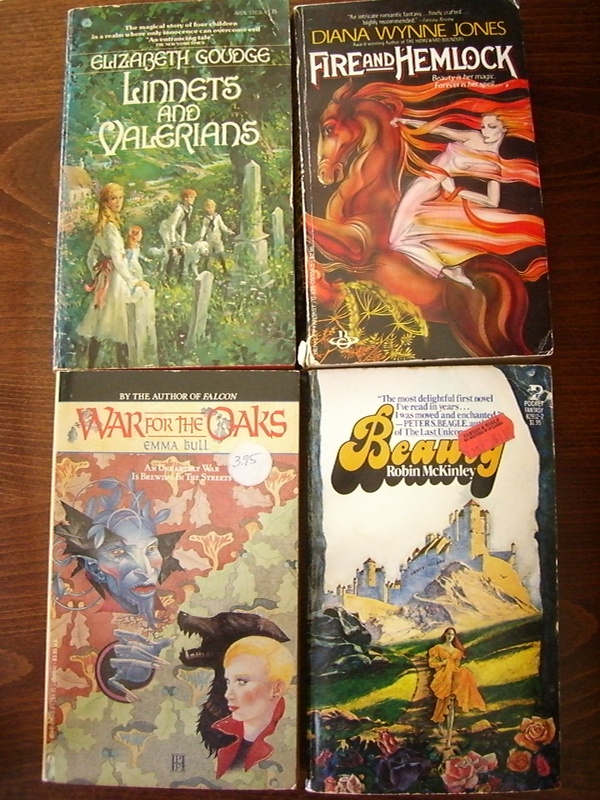 ), War For the Oaks by Emma Bull, and Fire and Hemlock by Diana Wynne Jones. Linnets and Valerians by Elizabeth Goudge was an impulse buy based on its cover. 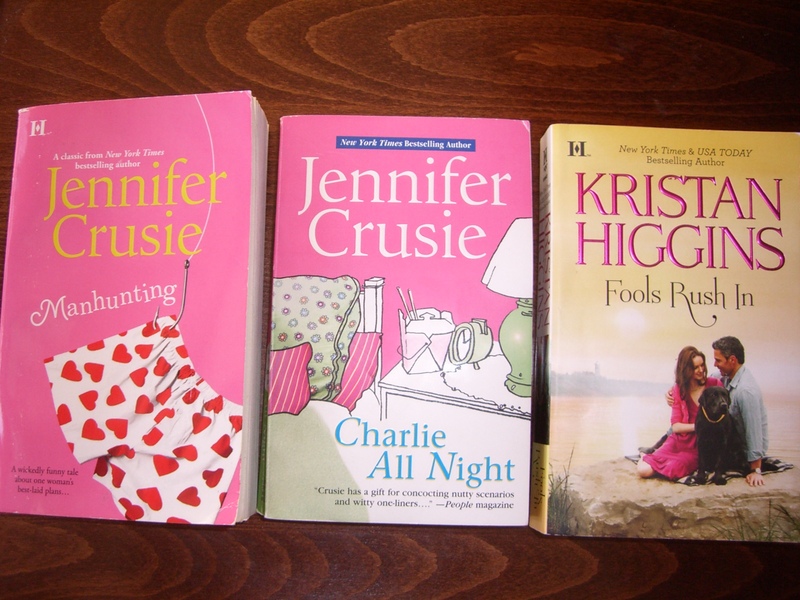 I actually can’t remember what I got as book #5..
.. but I think it was this Kristan Higgins book, Fools Rush In. In another used bookstore I got me some Jennifer Crusie since I haven’t read anything but Bet Me. I bought Charlie All Night and Manhunting there. Speaking of used bookstores, I got the above in AZ used bookstores. 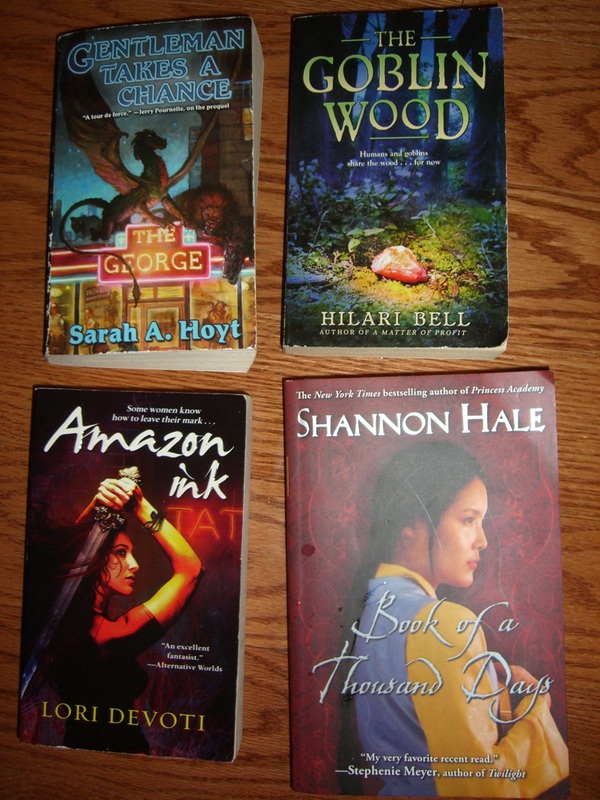 Gentleman Takes a Chance by Sarah Hoyt, The Goblin Wood by Hilari Bell, Amazon Ink by Lori Devoti, and Book of a Thousand Days by Shannon Hale. 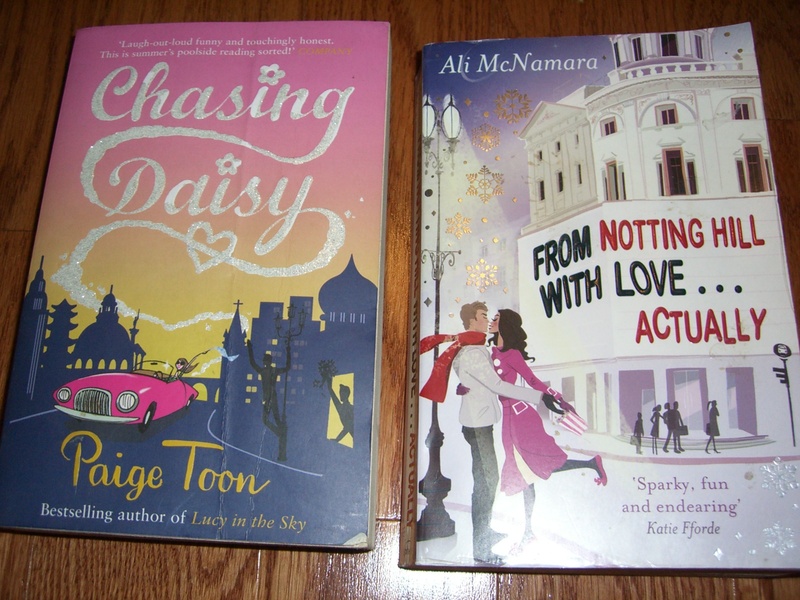 And then I just bought stuff online, like these two British Chick Lit books, From Notting Hill With Love.. Actually by Ali McNamara and Chasing Daisy by Paige Toon (unfortunately I am not loving them now that I started them, but that’s another post). And more stuff bought online. Oh Bookcloseouts and your sales! 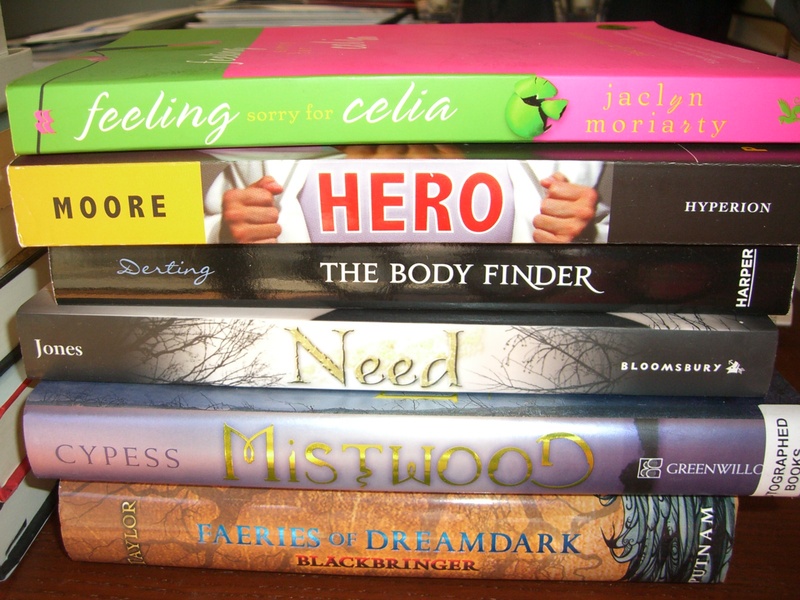 Feeling Sorry For Celia by Jaclyn Moriarty, Hero by Perry Moore, The Body Finder by Kimberly Derting, Need by Carrie Jones, Mistwood by Leah Cypress, Faeries of Dreamdark: Blackbringer by Laini Taylor (not included because I’m reading it and forgot to put it on the pile is Coronets and Steel by Sherwood Smith). And even more stuff bought online. 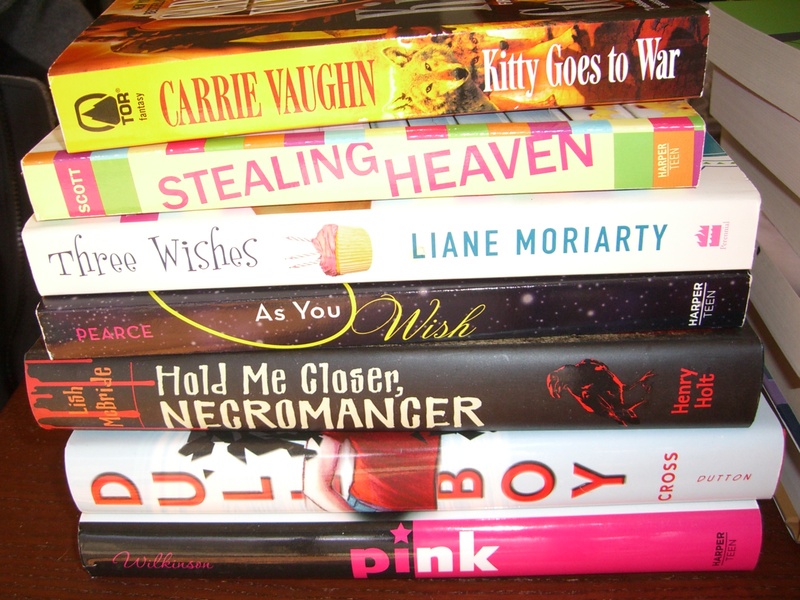 Kitty Goes to War by Carrie Vaughn, Stealing Heaven by Elizabeth Scott, Three Wishes by Liane Moriarty, As You Wish by Jackson Pearce, Hold Me Closer, Necromancer by Lish McBride, Dull Boy by Sarah Cross, and Pink by Lili Wilkinson. Hmm, I’ve been buying lot more YA than I used to! 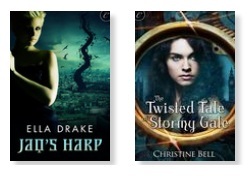 These pictures do not include the few ebooks I have also downloaded.. *shifty eyes*. Oh so my to-be-reviewed list is long now. It’s killing meeee. Yes, I don’t have to review everything I read. But! I want to. 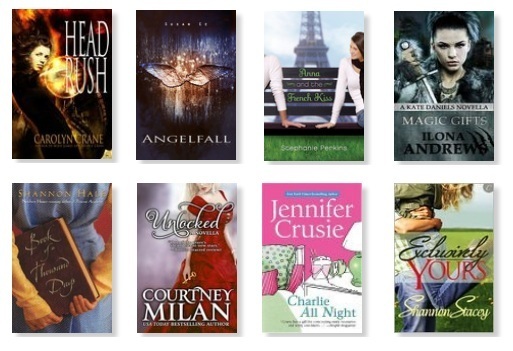 This entry was posted in Uncategorized and tagged tbr, used book sales by janicu. Bookmark the permalink. So many pretty covers and good reads. I have never seen the Sherwood Smiths in hardcover. And I love the old-school covers. I discovered Jaclyn Moriarty last year and totally glommed her books. Well, you’ve made me feel slightly better about my own book spend these last couple of months. That ‘one-click buy’ button on kindle books is too tempting. And then there’s BetterWorldBooks for all those out of print books I want. I am always jealous of how cheap second hand books are in the US. In Aus we pay the same price, or more, as you do for a new one! Yeah we are lucky with the used book prices here, definitely! Sigh, I did buy a lot. Looking at the piles I’m thinking: got to read faster. And review faster! Oh good, I have been sort of staring at the books and hoping someone would recommend what I should start with! Thank you, I was wondering if I should start MISTWOOD next. It goes to the top at any rate. War for the Oaks is one of my all-time favorite books. Enjoy. 🙂 I love it too.. (yep, I this is me admitting I got a second copy just because it had a different cover). Jealous that you have the hardcovers of Crown Duel and Court Duel, I have the Firebird paperback that combined both books into one volume. Look at those old school covers, love the one for Beauty and Fire and Hemlock (I heard they’re reprinting this one, I’ll definitely grab a copy when that happens). I’ve read the two Crusies in your pile and I can’t remember the details about them but I believe I enjoyed those. I agree with Bookcloseouts! The stash that I posted from a couple of weeks ago was from there. I have a friend who orders books from the site and has them sent here through a freight forwarder. Yay, you got Blackbringer! Hope you get to read that soon, would love to see more reviews for Laini Taylor’s middle grade books. And I still don’t have a copy of Coronets & Steel, I didn’t know it was available in Bookcloseouts. I have Three Wishes in my TBR pile as well so just let me know if you want to do a readalong of that. 😛 Really curious about Stealing Heaven and Hold Me Closer, Necromancer too. It’s so weird that I haven’t replied to this! Yeah, the Firebird paperback is what I had before too. I never saw a hardcover of these two before, so I couldn’t help myself. Oh bookcloseouts is the evils!!! I think they sent me some other email about another sale last week and I am making myself NOT LOOK. Hey, a readalong of THREE WISHES sounds good. Let’s tweet each other when we are feeling up to it? I’m going to stay away from bookcloseouts as well! I have an In My Mailbox post that I’m planning to post soon. It’s only the first month of the year and I’ve managed to buy several books. Argh, need to read them before I buy more. Stealing Heaven is my favorite Elizabeth Scott. 🙂 Also, I thought As You Wish was a fun read too. Also! ANGELFALL! I finished reading it over the weekend and it was awesome. I have to write my review for that soon, too. Sighh, I was thinking ANGELFALL wouldn’t live up to the hype, but yeah, I ended up liking it! I hear good things about STEALING HEAVEN. AS YOU WISH sounds like a cute book when I feel up to something fun. GIRL! i was loving the post, thinking, ‘Ooooh! so many books’ and I then it just kept going! You have some of my faves in there (like stealing heaven and feeling sorry for celia) and you also have a lovely bunch of rainy day comfort reads and swoony chick stuff. Oh, and I haven’t stopped buying. *cough*. So.. my to-be-read pile is really ridiculous and my to-be-reviewed list is getting there.